There’s been some concern from fans in the run up to release. The words ‘open world’ have been thrown around, and that’s a concept that really couldn’t be more of the antithesis to what made Metro popular in the first place: a series about claustrophobia, confinement, being trapped. 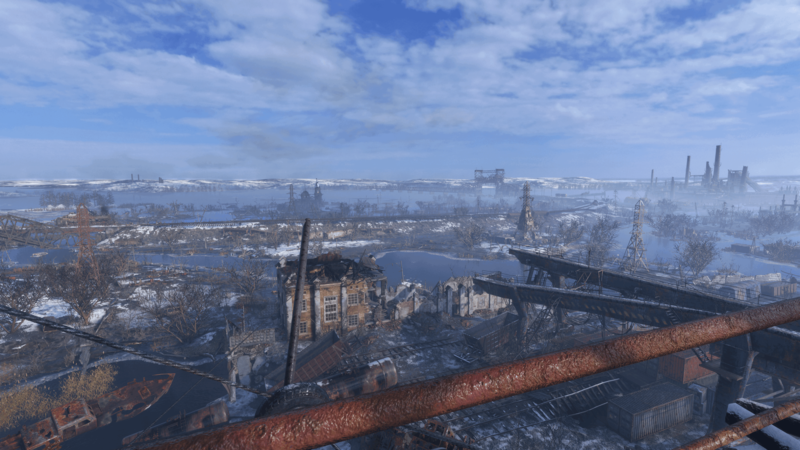 While Metro Exodus does bring a completely new sensibility of world design, it works brilliantly. The world of Metro Exodus isn’t really open world, mind you. It’s linear, yet wide. After some initial set pieces and story-related preambles, the core structure comes into focus. Your group has hijacked a train and are using it to cross the wastes of Russia and Eastern Europe, ravaged as they have been by the nuclear war. It’s a post-apocalyptic road trip, but it ain’t The Road. Along the way the train is forced to stop by obstacles, a lack of resources, and for other story reasons. Each time the train stops you’re booted off into a new environment. Each is large enough that it’ll take several minutes to traverse one side to the other, but each exists as a unique biome, allowing Exodus to offer a far greater variety of locales and obstacles than the dank tunnels of Moscow’s metro system ever could. Initially it feels fairly familiar, with you sliding down icy banks and exploring dilapidated buildings with that distinct Eastern Bloc architecture. Quickly enough, you’re rowing a little boat across a murky, creature-filled river, driving a banged-up van across an arid desert, or skulking through a picturesque forested valley. The rogue’s gallery is a rote who’s who of post apocalypse stereotypes – the bandits, the cannibals, the religious zealots – but each is well sketched and dispatched before they outstay their welcome. Each area carries with it its own design tweaks that offer something new to consider. 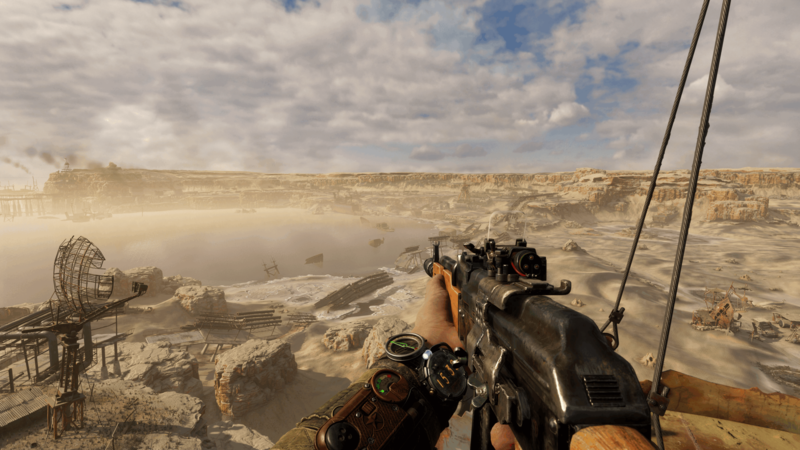 While exploring the Caspian desert, a sandstorm can roll in and cause chaos during a pitched gunfight. Some areas become more dangerous at night, while others have mutated, feathered bears that want to rip out your throat. The regular changing of scenery keeps you on your toes, while the nature of Metro’s core mechanics differentiates these apocalyptic sandboxes from the others games. The linear storyline of each area takes you criss-crossing across the map taking down enemy outposts and regularly diving into cramped buildings and underground facilities for some more classic-style Metro action. But if that isn’t enough, each map also features a range of sidequests and exploration opportunities. Metro is still all about limited resources and crafting, too, so taking the time to explore and complete optional content will drastically increase your chances of survival later. Each area should be savored properly, then, as there’s no going back once your train starts chugging on. While the structure is fresh, much else feels distinctively Metro. There’s the heavy, deliberate feeling of combat, worries about gas masks, filters, ammunition, and other supplies. All of this still feels great, and, most importantly, these features transplant into this more open structure brilliantly. The constant search for more materials has led, naturally, to a deeper upgrade and crafting system. Your backpack is essentially a portable workshop with limited capabilities in the field, but you can also bunker down for more in-depth crafting at proper workbenches. Here you can adjust parts on your weapons, clean your equipment to ensure it works properly and even craft extra ammo – but that requires being fastidious out in the world in scavenging from every corner of every crumbling building. The natural flow of all this is honestly a joy. Exploring a map, following your compass to the next core objective but taking a minor detour along the way to head to a building that looks as though it might hold supplies – it’s all rich in tension and atmosphere. On the way you might have a nasty encounter with some mutated beasts or wandering thugs, which in turn might cost you valuable ammo. When you do get inside those buildings, it’s all flashlights and night vision, tight corners and stress: it feels like Metro. In fact, the experience of playing Metro Exodus was mostly only dampened by bugs. The PC version is temperamental at best, crashing several times and often encountering nasty scripting errors. At one point I lost over an hour of progress because an NPC got stuck on the environment and couldn’t open a door for me. At another point I was left laughing when I was ejected from a moving train, thrown thousands of feet into the air as my excited comrades cheered and celebrated on board. The train steamed away without me, and I fell to my death. Nice. You’ll meet a range of endearing characters on your travels, but I wished I could’ve got to know many of them better. 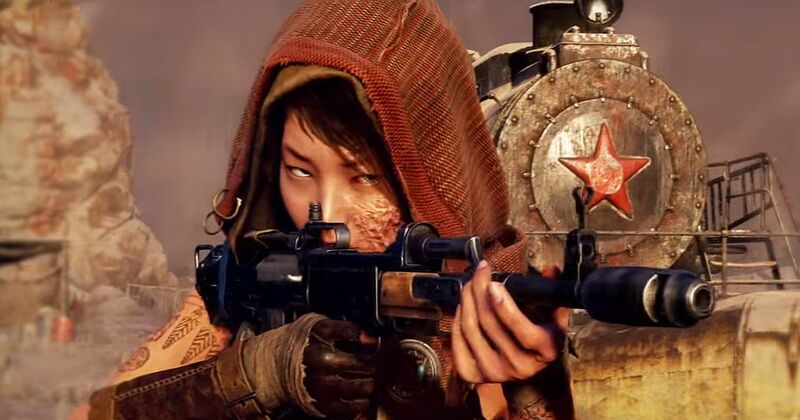 Speaking of comrades, it’s worth noting that Metro Exodus makes a big effort with character – for better and for worse. Unafraid to make time for a story beat, it means sometimes you’ll have control wrested from you in an immersion-damaging way in order to facilitate a slick first-person action set piece, or be rooted to the spot for what feels like an age while two characters talk about their motivations. It’s even got that The Darkness moment where you sit on a couch with your wife leaning across you, or totally Wolfenstein moments where a mangled, insane villain monologues at you before you begin a daring escape. Sometimes this stuff falls a little flat. It’s deeply ambitious, but it feels as though the budget wasn’t quite there to match those ambitions. Sometimes they click, however – stunning, one-off establishing shots of a crumbling environment, or moments on the train where, for a moment, there’s shades of the fireside camp shenanigans of Red Dead Redemption 2. Some moments are genuinely tender, too. Here the ambition of Metro Exodus shows, though it’s not at all where it is at its best. That’s when you’re out in the open world, scavenging and scrabbling together resources in order to repair your gas mask and stock up on ammo before going on a dungeon crawling dive into an abandoned bunker. It’s when a sandstorm rolls in midway through a slugfest of a firefight. It’s when scripting gets out of the way and solidly-built game systems can simply interact and create something special. When Metro Exodus does all that – which admittedly isn’t all the time – it’s a brilliant, smart sequel. Metro Exodus releases for PC, Xbox One and PS4 on 15 February. Review copy provided by publisher. Version tested: PC.